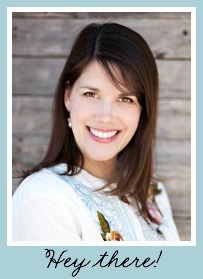 Today we have a guest post by my favorite reader: my sister, Arianne, from Little Pink Houses. She and I (and my brother, too) were ingrained from the time we were born with the notion of “I can do it myself and probably cheaper”. Arianne saw a cute vignette of stuffed fabric birds mounted on a branch and decided to make something similar for her daughter’s nursery. They turned out really adorably and would be completely easy to customize to any sort of decor. I asked her to do a tutorial for my blog because I knew these would be a not-too-difficult sewing project; plus I LOVE BIRDS! OK, Arianne, show us how to put a bird on it! First you’ll need to pick out some fabrics. Any fabric will work, but some are easier to work with than others (lightweight quilting cotton is easier than denim, for example. Silk would be a really lovely and elegant choice.) You can use fabric scraps you have on hand, you can ask someone you know who sews to look through their extras, or you can buy fabric quarters (called “fat quarters”) in coordinating fabrics. Most fabric stores sell these for around $1.50-2.00/piece, or in pre-coordinated packs for $5-10 for 5+ pieces. You need 2 fabrics for each bird. A safe amount is 8” square for each section of the bird. I recommend laying out your fabrics in pairs before you start, one piece for the top/head/wings and the other piece for the belly of the bird. If your pieces are different sizes, the larger piece should be for the top of the bird. Print out your pattern. I used one from SpoolSewing; you can download their free PDF here. Cut the patterns out of the paper. I made these patterns a little bigger because I found the 1/4″ hem to be a little too tight. It was very hard to sew a ¼” hem on such a small shape, since it requires a lot of turning as you sew. A few of my birds had to be re-sewn because I missed an edge. Give yourself a little extra room around your pattern so that you can allow for a bigger seam allowance. Next grab your first pair of fabric pieces . Choose the piece to be the top/sides of the bird. Make a fold in it, about 6” deep. Lay the bird top pattern along the fold of fabric 1 so that it will double itself when you open the fold up. Pin it down with a couple of pins. Lay your bird belly pattern on fabric 2 and pin it down. Cut them both out. (If you didn’t leave an edge around the paper pattern, just leave an extra edge around it now as you cut it out. I promise you won’t be sorry for giving yourself an extra ¼” allowance once you start sewing. Repeat this process with all your birds. Iron your bird pieces. The last thing you want is to get them sewn and stuffed and THEN notice that they are wrinkly, or that the fold is still showing across the top of one. Lay the top and bottom bird pieces together PRETTY SIDE IN. In other words, the sides of the fabric you want to show when you’re done should be facing each other. Starting at the tail, pin together one edge of fabric 1 and one edge of fabric 2. Pin about every 1-1 ½” and stop when you get to the end of fabric 2. Remember that these will be 3 dimensional birds, so the fabrics won’t lie exactly flat. You’ll have to sort of bunch the top piece a little, with little folds between the pins, to get the edges flush. They’ll sew up just fine, so don’t worry. Sew one edge of your first bird. (Although it’s generally easier to work in a sort of assembly line fashion—cutting all of the pieces at once, ironing all of the pieces at once, etc.—I found through trial and error that you should sew one bird completely and then turn it inside out to check it for seam holes before moving on to the next bird.) I used white thread, but you can use any color you want. The stitching doesn’t show much except on the tail. * GO VERY SLOWLY. You have to turn these babies a lot, and they are very small. It can be kind of hard to get them turned in time if you go fast, and the attractiveness of your bird, especially the head, depends a LOT on how evenly and carefully you sew these seams. Sew it poorly and your bird will end up looking more like a vulture! (Ask me how I know.) Also, remember to sew a little bit bigger hem than the pattern shows (if you’ve cut it with extra room) so you don’t miss any edges. Remove the pins and pin together the other edges of the two fabrics, again starting at the tail. These two will lay even less flat, with even more bunching between the pins. Just do your best to keep the edges aligned. Sew the second edge. Now keep in mind, when you get to the end of the belly fabric (#2), you can just keep going and sew up the bottom side of the head of the bird. I found it easiest to keep going up the breast, up the head, and right off the end of the beak. Then to come back and do the top side of the head separately. If you try to take that corner (around the beak’s point), you may end up with a weird-shaped beak. Note from Jennie: To keep any puckering from happening at the birds neck, make three little snips about 1/8″ away from each other right where the neck arches. You’ll cut from the edge of the fabric right up to the seam (but don’t cut the seam!). After you’ve sewn both sides and the head (the tail is left open), turn your bird inside out and check to make sure you haven’t missed an edge and left a gaping hole. If you haven’t, good! You’re a better seamstress than me. Now move on to your second bird. Once you’ve sewn up all your birds, and they’re right-side out, it’s time to start stuffing! I bought one 12oz bag of ultra plush fiber, and it was plenty to do about 14 birds. Use the eraser of a pencil to push the fiber down into the beak first. You don’t want to get done and find you have a floppy beak! Leave about ½” of the tail empty so that you can sew it closed. Finish the tail. You can do a fancy hand-stitch here to make the thread invisible. But after doing that with one bird, I found it way too time consuming. Instead I decided to just fold both pieces of fabric over, inward, ¼” and sew a straight stitch across the tail. You can see the thread, but once the birds are up on the branch, it won’t show much. And I actually think it looks pretty cute! You’re done with the sewing! Aren’t your birds so cute? Next select a good branch. You can buy fancy polished branches at the craft store. Or you can pick one off a tree in your yard. I recommend one with at least a ½” diameter on the main branch with ¼” diameter shoot-offs; too flimsy and it will bend under the birds’ weight. Lay out your branch on the ground and position your birds before you glue them on. That way you can be sure you like the final look without having to peel off mis-placed birds. I also recommend taking a picture because once you pick up the branches to mount them, you’ll forget where your birds went. Mount your branch. You want your branch to be at least an inch or two from the wall so your birds’ tails will fit behind the branch. So if you can find or buy some really long nails (3-4 inches), that will allow your branch to sit away from the wall. Hold your branch up to the wall and mark where you want it to go with a pencil. Put in a couple of nails to support the branch—allowing your branch to lie on them. Use some clear fishing line or thread to lash the branch to the nails. sitting level and looking the right direction. It’s a lot harder to move them once the glue has hardened. Put all your birds on and…voila! Birds on a branch! Thank you for posting this! At a craft fair recently, I bought 2 little birds made with this exact pattern. She used vintage embroidered linens for the fabric–they are DARLING! She glued a magnet on the bottom of the bird so you could use him as a magnet, and sewed a piece of monofilament to the top so he can hang from a branch. She sold them for $6.50 each and judging from the amount of work these are, I think that was definitely fair! These are adorable! I love how you made them, and putting them in that little branch is fantastic! I think they would make a great baby mobile as well. Very well done! Those are so cute … I pinned them! They’d look really cute in my girls’ room. Thanks for sharing the tutorial! Jessica, I think this project started out as a mobile, but the blog I saw that made the birds on the branch had changed the idea to make it wall art. So you’re right…it does make a great mobile! These are adorable. Saving them for future reference. Thanks for sharing! I posted this on Pinterest, Jen..I mean Hilde…it is great. Patchwork gosto muito de fazer, esses pássaros são lindos, no galho ficou muito legal, parabéns pela criatividade…Edileny Gomes. Answer me this my friend, why are some blessed with this “crafty” gene you have and others of us born to admire your craftiness! How do you think these things up or are inspired to make them? Kudos to you! I’ve got stuck and need some expert assistance! I have sewn the breast of the bird to one side of the main body, but i don’t understand how and in what position i sew the breast onto the other side. Please can you break this step down further, or send a more explanitory picture? Thank you for such fantastic birds! My sister is the expert bird-maker so I’ll have her email you! Best wishes on your birds. Send a photo when they’re done! can I make some of these and sell them at my church’s winter bazaar? what some cutie birdies…. thank you so much for sharing! I can’t wait to make some very soon! Your birds are beautiful! I am going to be having a baby in August and these birds perched on some branches would be a wonderful addition to my nursery! The website isn’t working so well. I’ll see what I can do. Thank You Hildie! I appreciate it! I look forward to hearing back from you! I also look forward to making these beautiful birds for my nursery! Hello Hildie- I absolutely ov these little birds!! I was wondering if you’d be able to email me the pattern since I can’t seem to get it from the link. I’d appreciate it so much. Thank you! Would you be able to email me the pattern as well? I’d love to use them in my little girl’s nursery! They’ve taken their pattern down so I’m trying to recreate it as best I can. Check back in a week or two! Beautiful! Any luck in recreating this pattern? 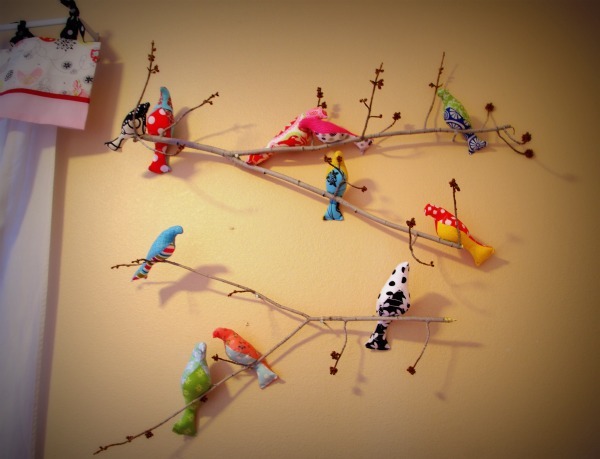 I would love to make some birds for my nursery. I would love to make some birds, too. Maybe you could upload the pattern somewhere? let me know their dimensions? I cannot access the free pattern. Is there a way you can email it to me? I love these birds and wanted to use them to create a mobile for my baby’s nursery. Any help is appreciated! Thanks! I enlarged the pattern and have tried to sew the breast to a point and go on and sew the head but it is not working’.Same problem as Joe wrote about in May 2012. You wrote that you would ask your sister to e-mail her more instructions. I would be so great full to hear from you or her and go on and finish. They will make great gifts.